A collection of cockroach legs? Just wait until they start selling at Sotheby's . . .
No plans tonight? The Brooklyn Historical Society is hosting a Collector's Night, with 20 collectors from across the five boroughs gathered together to "discuss and celebrate" the act of collecting. You'll find the usual amassor of presidential campaign memorablilia, plus some more unusual collections, like a man who collects specimen jars, archaic tools and objects picked up in cemeteries--letters, feathers, a dead bird, dried flowers, jewelry. (Bubblegum wrappers? Just wondering.) My favorite, though, the sight that just might tempt me to cross the bridge tonight, is "an assemblage of cockroach legs" cast aside by the owner's cat. That really stretches the definition of collecting and I would love to see how those skinny little legs are displayed. One might muse over the difference between this collection and the art of Damien Hirst. Are dead sharks inheriently more valuable? Hmmm. My cats kills the occasional stray water bug . . . I sense an opportunity. The first one who can consign a cockroach leg collection to respectable auction house wins. Read the whole story at The New York Times: Where Cockroach Legs and Snow White Have Something in Common. The best flea markets in America. Summer driving trip, anyone? The Huff Post has published The Only Guide You Need to the Best Flea Markets in America. Here's the quick list, but see their story for more details. Summer's half over, so if you're going to hit them all, you better put the pedal to the metal. WAIT! Huff Post, how could you ignore The Portland Expo Antique & Collectible Show? Hello visitors: the information on this site was complied and published in 2007–2012. In 2014 I updated the auctions and flea market listings. While I rarely (like, never) post anymore, much of the info here is still relevant, so please browse, follow the links, and see if anything interests you. Last spring I was standing on 27th street with my nose pressed against the glass of the abandoned Tepper Galleries. A reader of this blog had tipped me off to their closing. I could have scooped the New York Times article! But all around, businesses were being hit hard by the recession, and Tepper's disappearance just seemed too sad. But I'm happy to report that Adam Hutter, former principal auctioneer at Tepper, has started his own enterprise, Hutter Auction Galleries. His auctions are being are held monthly, on Saturdays, at the Cirker Fine Art Storage at 444 West 55th Street. Thursday I previewed Haughton's International Fine Art and Antiques Dealers Show, which runs this weekend through next Thursday, October 28. The promoters appealed to this blogger's vanity by sending me an invite to their press preview, so I slipped out of work and headed uptown for the opportunity to wear a press pass for the first time in my life. It was cool to stroll the aisles without the crowds and to appreciate the beautiful antiques without having to cower in my shabby boots next to the customers who could actually afford to buy these things. But what I really liked was watching the show go up. A sphinx stared at a vacuum, a box of trash bags was tossed at the feet of a leaping rabbit sculpture. Dealers bustled about, or bent down and polished the floor of their booth themselves. Haughton covered the experience in their blog entry "Moving In: The Grease Paint Behind the Glitter." This announcement is getting to feel redundant: yet another flea market is opening in Brooklyn . . . yeah! Hard to believe that just a year ago, all the markets were being pushed out. The weekly Williamsburg Flea Market debuts Sunday, June 14th. (NOT the 7th, as originally planned.) If that simple fact alone isn't enough to entice you out, they're offering complimentary drinks. Drinks early on Sunday–now that's a flea market you can really appreciate. Vendors will offer artwork, antiques, new and vintage home furnishings, clothing and accessories, food, books, records, crafts and more. Hours are Sunday, 10 am–6 pm, rain or shine. From Manhattan, stroll over the Williamsburg Bridge. The flea is a 10-minute walk from the Bedford stop on the L train, or from the Marcy stop on the JMZ line. Nice logo, eh? And I thought the Brooklyn Flea upped the ante. Check out more Brooklyn flea markets here. East Village flea market reopens! Mary Help of Christians Market Vendors have relocated. The market vendors have reformed for a great cause, to raise funds for the schools in the area that have lost funding for several programs. The Earth School, Thompson Square Middle School and P.S. 64, have welcomed the market to help raise sorely needed funds. Running for a few weekends in the fall of 2008, the market resumed for the spring of 2009 and has since opened as of May 9th at 4th St. between Avenues B and C. It will be running until June 14th and possibly longer. Open Saturdays and Sundays 7am - 7pm. New vendors are welcome to contact Jeanette at 212-979-2186 or Deb 347-216-4691. All are welcome to come and show your support for the schools and the vendors. See you at the Schoolyard! I remember a full 50% of the items above from my childhood. Those hipsters over in Williamsburg are making them cool again with the premiere of Artists & Fleas Vintage Market. Established in 2003, Artists &Fleas is a weekly market that showcases emerging designers and local artists. Their vintage push is next door to their regular space, Saturdays and Sundays from 12–8 pm (AND they stay busy with a market in McCarren Park). Go check it out, or better yet, dig through your closets, sign up to be a vendor, and go convince some kid how cool Mom's old casserole pan is. Cackle, cackle. Bayo Ogunsanya's lawsuit against Robert Langmuir has been settled out of court. The story broke yesterday in the Maine Antique Digest. While he is not allowed to give any particulars, Ogunsanya states that he will be allowed a percentage of Langmuir's gross sales when the Arbus photos are sold. This affair drew a lot of controversy last spring. Langmuir bought an initial set of photos from Ogunsanya, followed his hunch, did some research, discovered that they were early Diane Arbus photos of Hubert's Dime Museum and Flea Market freak show in Times Square, then went back to Ogunsanya to buy the rest of the collection. In a sort of dealer's fantasy trifecta, he put the photos up for auction at Phillips, where estimates ranged up to 120k each, a book was published about the adventure, AND a producer was trying to get a movie made with Phillip Seymour Hoffman playing Langmuir. Ogunsanya raised a ruckus, protesting that he had been robbed. The Phillips auction was pulled the night before the sale, (either because because of the lawsuit, or because Phillips hesitated over the price of the guarantee based on other Arubs results that week), and, sadly, Hoffman snubbed the movie proposal. Ogunsanya said "It was a case that [Langmuir] couldn't win, and he probably hurt himself by delaying the settling of it, because of the market. Hopefully, he will be selling them for as much as he can get and soon too. But the economy is what it is." Yes, the economy is what it is. Most readers who weighed in felt that Ogunsanya had had the same chances as Langmuir to do his research, and that it would send a big chill through the antiques and collectibles world if every lucky dealer who stumbled on a big find had to share gains. Well, feel the chill. Or, if you're on the other side of the deal, feel like a lottery winner. Opinions? Top 10 flea markets in Europe? I've been to the Brussels flea and I thought it was small and disappointing. Any opinions? I remember when my grandmother used to point out some tchotchke in a store and snort, "that's an antique?" And I'd think, well, of course it is, Grandma. Last Thursday, a young crowd went crazy over relics of my own recent past. While I and my advertising art-director and copywriter friends scramble for jobs in a dying-industry-meets-dead-economy-end-of-the-world-as-we-know it-Mad-Max (I could go on) scenario, the ads and posters we used to admire in awards annuals brought in prices that pleasantly surprised Posters Please. The auction was described as offering low-cost but still valuable items. One lot was this Milton Glaser poster . . . that's an antique? Well of course it is, Grandma. Check it out: a new button the left that links to a list of auction houses in the New York City metro area. I compiled it from a list the New York Times published in 2007 (wow, time flies). I tried to make sure the businesses were still viable, but if I'm wrong, or if you see any that I've left out, please let me know in the comments section below. Happy auctioning! Bad news: Haughtons' International Asian Art Fair was canceled this year. Good news: now you won't have as much ground to cover. There's still a lot to see, and The Magazine Antiques has compiled an Asia Week "to-do list" of alternative events. One of my favorite blogs is Reclaimed Home, which is about "low impact housing and renovation options for thrifty New Yorkers." The author, who includes witty pieces about her personal life, always seems to be up to a LOT: renovating her own homes (yes, plural) in Bed Stuy and Beacon, selling at the Brooklyn Flea, scouting out cheapo property in the region (I like this post on aesthetically pleasing mobile homes) . . . and now moving into the tag and estate sale business. This weekend she's putting on her second effort this Saturday, March 14, up in Beacon. The sale is a mix of antiques and vintage items left over from other sales, clean-outs, and shop inventory reductions, plus some consignments from local dealers. Get a preview of the weekend's goodies on Reclaimed Homes' Flickr page, and then check it out. The address is 69 Verplanck Avenue, Beacon, New York, and the sale runs 8:30am-4:30pm.I know no one wants to say the "S" word anymore, but this isn't shopping, it's recycling! Up until now, when I've searched for estate or tag sales in the region, I've turned to EstateSales.net, which is trying to be the national player in that niche. Well, now there's a new kid on the block: NYSales.net, which lists estate, tag, moving and yard sales exclusively in the tri-state metro area. It was started by a local who likes to rummage through books and other other items at estate and tag sales, and saw the value in consolidating as many ads as possible all in one spot. This weekend alone, he's listed almost twice the number of sales as his competitor. NYSales.net makes an effort to weed out virtual sales; the site is clean and easy to navigate. Hmmmm... wait. It lists antique shows and auctions. Looks like someone's moving on to my block, too. Lot 4 at Bloomsbury: John James Audubon, Northern Hare… Winter. Many people come to this blog looking for information on Bayo Ogunsanya's case against Robert Langmuir over the Diane Arbus "Hubert's Freaks" photos. As you might remember, Ogunsanya sold the photos to Langmuir, and then claims he was hoodwinked, because Langmuir realized their true value but didn't clue him in. The photos, worth millions, were scheduled for sale at Philip's, but at the last minute, Brooklyn Federal Court blocked the auction. In October, a motion to dismiss the case was denied. Whille most people who commented felt, basically, "Seller Beware"–that Ogunsanya had no case–the law appears to disagree. If Ogunsanya wins, will it change the way that dealers do business? Read this update from The Art Law Blog. Here's a partial list of this weekend's surrounding sales, courtesy of EstateSales.net. The International Poster Center is holding a reception and party for its new exhibit, Razzia and the Art of Advertising, Thursday night (tomorrow) from 5 to 8. The artist will be there to sign posters. They say he's "synonymous with the retro-deco style of the 1980s." Yeah, I remember advertising in the 80s. First, no Photoshop, so art directors (like me) didn't have to do everything ourselves and could actually commission real artists like Razzia. Second, lots of drinking. Now everyone works too hard. Do I sound bitter? Maybe I'll go check this reception out, see if they have some free wine, and walk down memory lane. In the coming months, I'm going to add to the sidebar guide a listing of area tag and estate sale providers. Here's a partial list of this weekend's surrounding sales, courtesy of EstateSales.net. Do you go to estate sales in the area, and if so, how do you find them? Remember August? Just a few months ago, expensive new apartment buildings had about finished displacing the antiques and flea market scene in Chelsea. The Antiques Garage, the most authentic flea market left in New York City, was losing its home to a developer who bought the land for $42.7 million. Closing day was slated for November 30. Lot 60 at Christie's Open House sale, Morris Louis, "Bird"
Who doesn't love Toulouse-Lautrec? 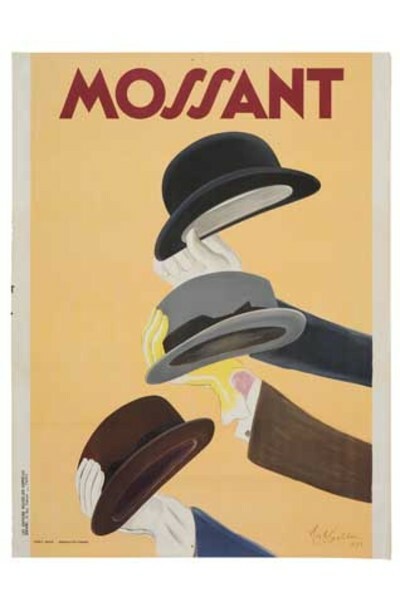 Now is your chance to view his rarest work at the International Poster Center in New York City through January 11, 2009. "Toulouse-Lautrec: 100 Prints and Posters" is the largest exhibition and sale of the artist ever assembled. If you're one of those lucky people with change still rattling around in your pockets, ask them to gift wrap one of Lautrec's famous posters (seemingly ubiquitous, he created only thirty) and bring it home to hang above the tree. Or snag a rare piece of ephemera like this 1896 Christmas card, made for the performer Mary Belfort and one of only five known examples, two of which are in museums. Also on display are working proofs (including one torn in half by the artist and taped back together by his assistants), original drawings, oils, and a ceramic rendering of the star Yvette Guilbert. The International Poster Center is at 601 W. 26th Street on the 13th Floor. Hours are Monday–Friday 9–5:00; Saturday and Sunday 11–6:00. Closed Christmas and New Year’s Day. The auction houses are taking a break from next week to early January. I've got some leads on some new flea market and auction stories, which I'll break after the holidays. Until then, I'm lapsing into a sugar coma, and I hope you are, too. In the words of Toulouse-Lautrec: "Joyeux Noel!" Contemplating the reductions in auction spending, no doubt (okay, cheap joke). At Christie's, lot 286 in sale 2062, A Portrait of a Seated Woman by Rene Gruau. At Bloomsbury. Lot 291: SCUDDER, Samuel Hubbard, The Butterflies of the Eastern United States and Canada with special reference to New England. How badly do you miss the Avenue A Flea? Next weekend you'll find it resurrected at the Outdoor Flea Market & Art Fair at East Side Community High School. Vintage items, collectibles, clothing, jewelry, shoes, books, art, food, crafts and more will be for sale in the school's basketball courts and garden at 420 East 12th street (between Ave A and 1st Ave). The date is November 8–9th, 2008; hours 9–5. The flea is a benefit for the school's art students, who will be using the proceeds for a trip to Europe, where they will broaden their arts education . . . although I'm hoping there are a few aspiring dealers among them who will haul some goods home for a flea market next year, perhaps. You'll find a reproduction of the above poster on the living room wall of every wannabe hipster in New York City. One-up your friends with the real deal.